For 2010, the moonroof is optional on the 328i and 328xi sedan and coupe models. The BMW Professional radio system with HD Radio reception is now standard equipment across the line. A HiFi sound system remains available with selection of the Premium Sound with Logic7 sound system option. 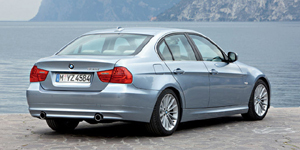 Find the used BMW 3-Series of your choice from a dealer in your area. Search our used car listings now.